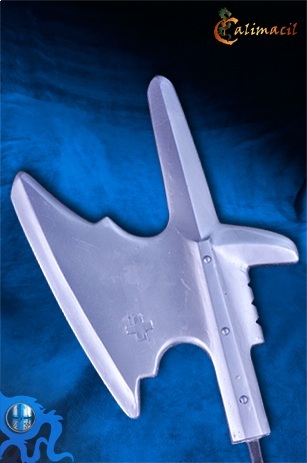 This is a stand-alone Halberd head; the staff to which it normally is attached is not included. This allows you to select precisely the staff you want and to have it precisely the length that is suitable for you. You can mount the Halberd Head on a short staff and use it one-handed, or you can mount it on a long staff for a more traditional look and for greater reach. You can use one Halberd Head per staff or you can put one Halberd Head on each end of your staff for double trouble. It's all up to you! 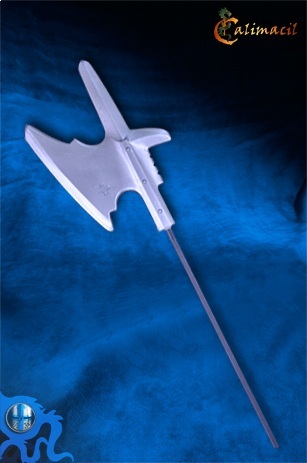 The Halberd head has been reinforced and modified with the addition of a 20 inch/51 cm central fiberglass rod to allow for greater sturdiness during use. The head can be fixed to a bamboo pole or inserted in a pair of fit together PVC tubes. The halberd is rigid enough to push opponents back without hurting them. This polearm is ideal for historical military formations or martial arts courses. The standard color is steel. Here is a video on how to assemble the Halberd head to a pole; scroll to the bottom of the page. -foam thickness from shaft to end/tip: +1 ½"